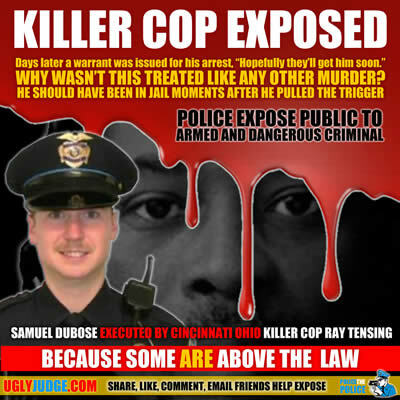 Cincinnati Ohio Killer Cop Ray Tensing Shoots Samuel Dubose 43 in the head execution style and lies about it. Cincinnati Police Officer Ray Tensing was indicted for the murder of Samuel Dubose. The incident occurred after Tensing pulled over Dubose for a missing license plate. According to the police account, Dubose refused to provide officer Tensing with his driver’s license, producing a bottle of alcohol instead and refusing to exit the vehicle. Tensing originally gave two different accounts of why he shot Dubose in the head that fateful day. In the official report, Tensing claimed that he was being dragged by Dubose’s vehicle as he drove off. However, in the call to dispatch, Tensing made no mention of being dragged and instead said that he was “almost run over” by Dubose. “I feel sorry for his [Dubose’s] family. I feel sorry for the community, it should never have happened,” Deters said. Deters explained to the media that Tensing’s account of the shooting was based in lies, explaining that the officer’s body camera showed what really happened. “It is our belief that he was not dragged. If you slow down this tape you see what happens, it is a very slow period of time from when the car starts rolling to when a gun is out and he’s shot in the head,” Deters said. “He [Dubose] was simply, slowly rolling away,” Deters added. During the press conference, Deters said that Tensing has been officially charged with murder and voluntary manslaughter. He faces life in prison if convicted. Prior to the indictment, the city refused to release the body cam footage, which set off a string of protests. He was correct. Sam Dubose was murdered because he didn’t want to be extorted for a missing front license plate. After reviewing the video, it is clear that Dubose posed no threat to Tensing. Tensing should have let Dubose drive off and called it in. Instead, Tensing fired on Dubose, striking the 43-year-old man in the head and killing him. Had Tensing not been wearing a body camera at the time of this shooting, it is highly likely that he would still be on the force and this shooting would have been ruled justified.